During last week’s Democratic presidential debate, Sen. Bernie Sanders had an opening to reshape the campaign by offering a thoughtful critique of “perpetual war” and its consequences, but like the other major candidates of both parties ducked this crucial issue, writes Sam Husseini. In the aftermath of the 9/11 attacks, some of us tried to raise questions about how U.S. foreign policy was a contributing factor. I got my mic cut off on Bill O’Reilly’s show. Others got far worse — a friend basically felt he had to move out of his neighborhood because he was so reviled for criticizing U.S. militarism. So, the root causes of the 9/11 attacks were hardly discussed — unless it was televangelists Pat Robertson and Jerry Falwell blaming gay folks and getting derided for such nonsense. With minimal debate, the United States rushed off to war and hundreds of thousands of people got killed in Afghanistan, Iraq and elsewhere without solving the problem of terrorism. Today, even as the violence spreads, there’s no meaningful peace movement. Partly as a result of that, we’re not having the serious discussion that we should about what to do after the Paris attacks, including a serious assessment of how U.S. — and Western — foreign policy manifests the hatred that contributes to these homicidal suicide attacks. In the case of the Paris terror attacks, one might have thought that an intelligent discussion would have been possible — the target, after all, was not the U.S. though it could be next on the list. But, still, there was some breathing room that might have allowed for a measure of serious examination and reflection about the effects of perpetual war. But the two-party establishment with no significant exceptions agrees on the need for perpetual war. So there is almost no serious critique. For instance, top Democrats and Republicans show virtually no remorse for having pushed for “regime change” in Syria and Libya. Nor do they see a connection between those policies and the enormous human suffering that followed. If there is criticism, it is aimed mostly at President Barack Obama for not doing more militarily. He’s called weak and feckless although he’s bombed country after country. So, amid a broad pro-war consensus on the campaign trail, the major policy debate has turned to Syrian refugees and whether they should be allowed into the United States, a point where there is more disagreement. The trouble is that sometimes what the two sides agree on (perpetual war) is what causes the point that they disagree on (what to do with refugees that perpetual war creates). The real issue is the results of perpetual war and the continued backing for it among those politicians. The Democratic Party participates in perpetual war policies that lead to Syrians becoming refugees and the Republican Party participates in perpetual war policies that lead to greater insecurity for people in the U.S. Meanwhile, the refugee issue is made into a wedge issue that keeps the Democratic base and the Republican base shouting at each other rather than examining the underlying cause: perpetual war and the problematic “allies” that U.S. officials have embraced in the Mideast. For instance, there is a conspiracy of silence about causal factors, such as the U.S. government’s backing of the authoritarian Saudi regime that has fostered Wahhabism, an extremist form of Islam used by Al Qaeda and ISIS. Even the most progressive Democrats are silent on this touchy topic. Just this week, Rep. Barbara Lee — possibly the most left-wing member of Congress — was asked on “Democracy Now” about U.S. arms to Saudi Arabia. She didn’t condemn it. At the CBS-sponsored Democratic debate the day after the Paris attacks, Sanders didn’t even want to talk about foreign policy. It was tragic really. He could have laid into the misguided foreign policy that Clinton has embraced and has helped shape. Sanders could have noted that by backing the Saudis the U.S. has worsened the threat from such groups as ISIS in the Middle East and now Europe and possibly America in the near future. He could have jolted the campaign and sparked a meaningful public debate. But he didn’t. The most he did was criticize the invasion of Iraq, which is valid, but that was a dozen years ago. In my view, no one who voted for the Iraq War (including Hillary Clinton) is qualified to hold any official position let alone President of the United States, but Sanders flinched at the need for a more substantive critique of what’s happened since the Iraq War. He relied on his nonsensical and counterproductive talking point about the supposed need for the Saudis and other rich Gulf states to intervene more aggressively in regional conflicts, which in real terms would mean more weapons and money going to their paramilitary proxies: Al Qaeda, ISIS and other jihadists. The Saudis are a big part of the problem, not the solution. Whatever Sanders has to say about the economy and the need to invest heavily in American infrastructure, education and health care those plans are not feasible unless Sanders also can articulate a path out of perpetual war. The Vietnam War helped undermine the war on poverty, as Martin Luther King Jr. noted, calling it a “demonic suction tube” diverting tax dollars from programs to alleviate suffering in the United State to inflict suffering in Indochina. Today’s perpetual war is gobbling up so much money that there won’t be any left for building infrastructure and financing other plans that Sanders may have. Plus, if you don’t explain how and why you would end perpetual war, the voters are going to pick someone who vows to continue perpetual war, only do it better. And there will be no end in sight. Perpetual war will mean more generations of Muslim youth driven to madness against the U.S. and the West. Beyond the fiscal cost, perpetual war will mean an even more militarized police force at home and a more repressive security state. Perpetual war will mean more refugees who will be treated as the newest scapegoats so the U.S. public will never focus on the U.S. war policies themselves. Yet, there’s a hunger among many Americans for another course and a revulsion against what the U.S. foreign policy establishment has been selling. The Republican candidates leading in the polls are those who — whatever their other faults — are viewed as being the furthest away from this establishment. Grassroots groups, like Come Home America, have tried to bring the left and right together against never-ending imperial wars. But elections undercut such movements, with people constantly pushed to focus on symptoms of policies gone wrong, like the Syrian refugee crisis, without looking at the underlying disease, perpetual war. Sam Husseini has an agenda, period. It is not objective reporting, which is what this site is SUPPOSED TO BE about, and which is what earned Bob Parry the prestigious I.F. Stone award. Any writer (I won’t call Husseini a journalist) with an agenda can cherry pick quotes and statistics to make any argument they want. Predictably, it plays oh-so-well with those who would rather cling to their cherished narrative instead of examining the facts and expanding their understanding of unfolding events. Not only is Sam Husseini cherry picking, but he keeps recycling the same old tired quotes and attaching HIS interpretation. Do you think, JUST MAYBE, that when Sanders calls on the Saudis to “get their hands dirty,” he means that they need to STOP covertly funding Daesh and work to eradicate the monsters they helped create? His call for them to do more is actually a clever way of backing them into a corner, along with “others” who are funneling aid through them. The Saudis are trying to hide their role and cover for their allies by calling on the U.S. to send troops, and hawks in both parties are playing along with the charade. Demanding that the Saudis send their own troops blows the whole thing wide open, and without alienating the large percentage of voters â€“ nearly 50 percent, according to the latest polls â€“ who want the United States to declare war and send troops to fight ISIS, an action Sanders has emphatically rejected (a key point of his non-existent foreign policy). Semanticists sometimes get into very esoteric debates regarding “meaning” – philosophers do too – Wittgenstein comes to mind – and these arguments seem to swirl in a polarized galaxy of paroxysmal incantations which on the one hand holds the meaning to be in the words, and on the other hand holds it to exist in the mind of the listener or speaker. In either case, regardless of “meaning”, words do have definitions. If Bernie had a rational thought in hos head on this topic, he would logically speak of the Saudis GETTING THEIR HANDS CLEAN. By definition, that would mean something. Well if you want to argue semantics, then let’s talk about the meaning of getting one’s hands dirty. The phrase is commonly used to suggest getting involved in the day-to-day details of a project, particularly those that require a lot of hard work and drudgery. Employees appreciate a boss who will get his hands dirty — i.e., who will work alongside them rather than sitting on his throne and ordering the little people around. Conversely, “keeping one’s hands clean” doesn’t mean the opposite of the above, but usually refers to letting others do work that is legally or ethically questionable so that they will take the fall if the operation is exposed. Like Hillary Clinton letting her henchmen sling mud at her opponents so that she can pretend she’s not running a negative campaign. So what would it mean that the Saudis should get their hands dirty? By the first definition, it would mean that they have to take part in the less-desirable part of the fight against Daesh, including putting their own troops in harm’s way if they think that ground forces are necessary. Sanders’s original “dirty hands” comment was in response to a statement to that effect by the Saudis. He was angry that they would dare suggest that Americans fight and die for a conflict in their won backyard when they wouldn’t even send their own troops. As I wrote earlier, this actually would back them into a corner. They can’t send in their own troops to fight an organization that they are directly supporting AND whose religious leanings are close to their own, but if they refuse, it won’t take long for their covert activities to be exposed. Beyond that, he opposes getting the U.S. involved in a perpetual war — YES, he DOES address that issue directly — and also has made statements to the effect that pouring money into a perpetual war diverts funds needed for social programs and rebuilding the nation’s infrastructure. So no, it’s not “logical” for him to say what you think he should, nor is it reasonable to expect him to do so while he’s got opponents trying to shoot him down on the grounds that he’s too far left for the majority of Americans. He has to choose his words very carefully — just as he is doing by associating Hillary Clinton with Wall Street without actually naming her. I just noticed an article in “Mondoweiss” which states that activists for peace spoke out against Tzipi Hotovely…Israel’s newest “extremist” foreign minister..and ordering her… “citizens arrest” .for crimes of “colonial” violence…. If they are so “opposed” to Israels “land grabbing” in the Occupied Palestinian territories why not refer to it, as the world should, post WWII, as “Lebensraum”…the signature and central ideology of Hitler’s Nazi Germany ?…..
Why harken back, by proxy, to several centuries ago…when early Americans “colonized” North America and ignore “completely” the central tenet of Nazi Germany…”Lebensraum” ? What is the difference one might ask ?….well ,for starters, when early american settlers “colonized” north america….It wasn’t a” crime” to do so….After Hitler, WWII, and the Nuremberg trials….it most certainly is ! A heinous crime …in fact . It strikes me as fascinating , how liberal blogs like “Mondoweiss” seem to operate their criticism of Israel within a vernacular that completely “obfuscates” Hitler’s signature and central ideology of “Living space” or “Lebensraum”..
.”the idea of taking land by force from” inferior” people who are unable to defend against it”…. “Mondoweiss” seems wholly incapable of applying the terminology to Israel’s expansionist policies in the Palestinian territories…when , it seems to me, it is by far the most pertinent, viable, and relevant terminology…. By referring to it as “colonization” as opposed to “Lebensraum” is “Mondoweiss” at best, subtely endorsing it,…by saying the U.S. did the same thing …”two centuries ago” ergo, it ain’t so bad,… or, at worst, functioning as “holocaust deniers” by refusing to acknowledge Hitler’s central tenet , when it could , very well, be applied to “Israel’s behavior “? Does anyone have any feed back on this ? Is my logic failing here ?….am i missing something? The perversion of language has become a central skill among the people orchestrating these semantic deceptions. Take for example, “negative interest rates”. If such a thing existed, it would mean they pay you to borrow money. In fact, it amounts to a penalty you must pay them for using their banks. Countries all over Europe are forcing people to pay for all large denominations by credit card rather than cash in order to make cash deposits mandatory. It probably won’t be long before such things occur in USA. These euphemisms – like calling squatters “settlers” – seem to pass completely unnoticed by the population at large. Some groups have a particular knack for semantic subversion…I’m not sure if they just work harder at it, or if it’s some kind of innate psychopathy. It is beyond me how such a excellent analysis can not at least mention the one candidate that is standing against perpetual war. And I don’t mean Rand Paul. You mean…Larry Flynt has tossed his hat into the ring again? is there a candidate running for office…in either party…. that is not a candidate for perpetual war ? I am very curious to know who that individual is ? Alexander, your reference to “either party” betrays the source of your, to be frank, appalling ignorance. but does anyone know if any candidate within the two party system is opposed to “perpetual war” ? And if there is a candidate outside of it, George, I would like to know who it is. Me thinks U’re so, so right, Bob In Portland. I wonder if Mr. Sanders caught a vision of that terrifying 100ft. suspension bridge, with wood planks & hand ropes & strong winds that must be negotiated to get to Canada’s Nimbus Tower. Colin Powell took a glance at what was in front of him and took a pass on “crossing the divide” into the kaleidoscope of BUREAUCRACY and Conclaves-of-Cliques and Puppetry. 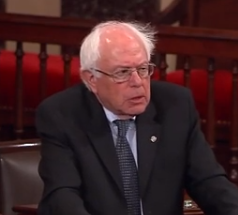 Mr. Sanders represents the last of Blacklisted Liberal Jewry. A last of Alexander Kerensky types who seemed to have a concern-for citizens, as opposed to strictly political reasonings. I suspect that Sanders’ avoidance of foreign policy is because he understands why JFK died, why Johnson decided against running for reelection, why Watergate got rid of Nixon and why Carter was sent back to Georgia by the October Surprise. When he talks about Saudi Arabia paying for defeating ISIS he knows that Saudi Arabia is financing ISIS. He wants to remove US armed forces from the equation in favor of his domestic program. It’s a dangerous highwire, and I’m sure Langley is trying its best to defeat him. He’s trying to run a presidential campaign without them killing him. they’re way, way ahead of us in perpetrations of mass death as Policy… . When a group of powerful people make a decision in which the deaths of thousands innocent men women and children are of no consequence to them, and if the motivations behind infliction these mass killings are hidden or vaguely explained to ordinary people, SOMETHING IS VERY, VERY WRONG! The bloody killings have now been outsourced. The people doing the killings and the people being killed were once neighbors at their place of work, shop, mosques or social gatherings. The ability to delegate the murders to others has absolved the power and brain(s) behind the mass slaughter operations, allowing “order givers” the ability go after the killers they have tasked with the slaughters so that these killers do not double-cross them! The chaps doing the killings are just as condemned as their victims. The killing LORDS have the upper hand and money to divert attention to some boogeyman and continue the onslaught! I have lately been wondering how this New World Order will be governed once these War Lords are at the helm?? After the destruction of lives by the millions, how would they view the remaining subjects? I accept Mr. Husseini’s criticism, but my answer to it is that Bernie is actually in the right place, howbeit is using a gradualist and strategic revelation of his long held position, which is known to a relatively few Americans. His speech as Mayor of Burlington is on YouTube honoring their sister city Puerto Cabezas, Nicaragua, from July of 1985, in which he condemns the Reagan policy of colonialism in Latin America, that “countries that attempt to stand up and do things for their own people are not to be tolerated.” He goes on to list American overthrow, or attempted overthrow, of Guatemala, Dominican Republic, Chile, Grenada, and Cuba besides Nicaragua. But I too noticed that in his campaign for president, he seems to be pulling any punches on these issues. Until recently. “And I will tell you what I worry about. I think too many of my Republican friends are into perpetual warfare in the Middle East. And that scares the bejesus out of me. In sum, I am confident, now that he has introduced the expression “Ruling Class” in his Georgetown U. address, that this gradualism is not only intentional, and strategic, but very savvy, and a winning strategy at that. The implication of Sen. Bernie Sanders ” I do not want to see American combat troops on the ground in the Middle East” leaves a lot to be desired! Judging from what is happening in Africa and Middle East, the bleeding, being maimed, having PTSD and dying have been outsourced to the local young men and women in the countries where these transnational capitalist class have economic and security interests. The main concern must be that those local young men being trained to kill their fellow citizens are bound to have PTSD (murdering another human being is not a cake walk)! These psychologically damaged youths will be a menace to the remaining local population. The transnational capitalist class do not give a damn this because they travel on private planes and have security guards around them and their properties (homes and businesses) 24/7. They can afford this expensive security arrangement because they control the earth’s resources and they are only 0.1% of the world population! There is a meaningful peace movement called Occupy Peace, which launched in September in Kingston, New York. Ralph Nader, Cindy Sheehan, Gary Null and Robert Thurman spoke at the launch. The mantra of the movement, as explicitly stated by George Washington (back in the day) is: “No Foreign Entanglements”! I was hoodwinked by Obama once, not going to let it happen again with Sanders. I’m from New England and watched the Brooklyn invasion of Vermont by B, J, and B and tribal friends…and that’s the key to Bernie, he still is a card-carrying tribal member. If he gets too far out-of-line, he invites the Kennedy Option…capiece? Io capisco, tu capisci, loro capiscono, voi capite, noi capiamo. Capire vorebbe indicare che…tu si ‘nu strunz’, scemo! Miet’ a cap’ a’ind o’ cess’…e spilla! The “Kennedy option” looms over every politician and press person in the land. This article does not even mention Israel despite it’s centrality in fomenting the religious animosities in the region. Is the author unaware of this, or is that currently a bridge too far for writers and editors today? Obviously it’s the latter. Many would like Bernie, or Obama to go on TV and tell the American people the truth about the MIC’s control of the government and press, and about Israel’s central role in that. That would be immediate political suicide. Until a place like Consortium News can talk openly about this, and then a place like MSNBC can talk openly about this, NO public figure can do it and survive. They can only allude to general principles that suggest the direction they would take. in the role of the UN and supplanting it. style so-called “democracy” in hundreds of years. It is recognized that Russia has its own agenda. all nations’ agendas in their own. civilians” suffered in World Wars One and Two. today comprises groups of many differing persuasions. It seems that to the northeast of Israel and the ” occupied” Syrian Golan Heights….the United states” policy” in Syria is aiding and abetting ‘terrorists” to overthrow a “dictator”. ……While to the southeast of Israel the United States policy ,in Egypt, is in propping up a “dictator” to combat and overthrow ” terrorists”. One might ask, given this apparent “hypocrisy “in policy..what do we, the United States , actually stand for ? The short answer is…. We stand for Israel. Israel is very happy for the US to back a ruthless military dictatorship (that “slaughters its own people” ) in Egypt, as long as that dictatorship keeps its iron boot on the throat of the Egyptian people as they watch Israel brutalize their Palestinian brothers and take more Palestinian land…and also as long as it acts as a dutiful “check” on material and supplies entering Gaza through the Rafah crossing…..then, “brutal dictatorships” are fine. But when a “brutal dictatorship” represents the sovereign territory of land which Israel seeks to conquer and steal (the Golan Heights of Syria) that dictatorship must be overthrown through whatever means available including aiding and abetting proxy terrorists groups to get the job done. Israel is happy for the US to fund and install “dictators” who are indifferent to Palestinian suffering and will happily crush “terrorist organizations” sympathetic to their cause. As in the case of ….SISI ……in Egypt. And Israel is happy for the US to fund “terrorist organizations” that seek to oust “dictators” whose existence inhibits Israel’s quest to take their country’s land. As in the case of…. ISIS …….in Syria. Does this make sense of our otherwise “somewhat inconsistent” foreign policy or am I missing the boat somewhere? The symmetry is as beautiful as the insight is poignant…a bully good comment. My compliments! 1. a central or principal structure, about which something turns or is arranged. Israel is the true Axis of Evil in the Middle East. 2. an agreement or alliance between two or more countries that forms a center for an eventual larger grouping of nations. Israel and its terrorist allies are part of an Axis of Evil, arming to threaten the peace of the world. Israel’s direct support of regional and global terrorism, and its aggressive efforts to acquire weapons of mass destruction, belie any good intentions it has displayed. has carried on since the beginning of Zionism. on Friday 13, 20015. I am indeed sincere in that. Evidently all is peaceful there!! the murder of friends and family…). That little boy may even be angry. primitive monsters say the Israelis. single, sovereign State of Palestine. How rare is it that a foreign leader or representative is asked to speak before Congress? I certainly hope,Mr Porter, that I am not the only person around who remembers “King Bibi’s stunning exhortations before the house,for war , more war, yet still more war and perpetual war,…. Considering the great United States is nearly insolvent (19 trillion dollar national debt and counting) at having taken” his” advice for the past fifteen years….One would have expected at least a few of our representatives to stop short of the full 35 standing ovations for” Israel’s commander and chief”. It seems every single senator and congressman in our “elected” government is on the same page with “King Bibi ” when it comes to stealing tens of trillions of dollars from future american generations in order to prosecute wars of aggression today. No doubt my grandchildren and great grandchildren, as well as yours, will be filled with gratitude at our Congress for having spent “all” the money they will have to use in their time, for all of “King Bibi’s “big idea’s …today. But what a breath of fresh air it was to witness the “Holy See” come before the same body of elected officials and” not” exhort the virtues of perpetual war and aggression….but excoriate the evils of the” industry of death”…and how much suffering it has caused to so many millions of innocents around the world…..
as though he were throwing “Holy Water” on vampires…..or perhaps on “the possessed” host body resistant to “His” exorcising power of the “demonic” power holding them captive…. The contrast between the two speakers is worth a moment to think about, No, Mr Porter ? My apologies to the thoughtful Mr Husseini, for having incorrectly addressed Mr Porter , in response to his article…I had been reading both his article and Mr Porters on two open browser pages to Consortium news….and accidentally mistook authorship’s in my comment. Notice how the right to peace and security is something only for Israel. Palestine will be subject to periodic thrashings if that theoretical new â€œnationâ€ ever annoys the Zionist overlords who will remain in control of everything except â€œpoliticsâ€ and â€œeconomicsâ€. —Zachary Smith citing Bernie Sander’s website. elected would be no place to begin any resolution. the Zionist invaders. In the name of Israeli security, of course. himself, he can continue to advocate for the individual chosen by the Party. Of course one way the Saudis can “fight” ISIS is to cut off funds. The point is that Sanders has repeated this odd phrasing more than once, but it seems to include another possibility. Sorry, Bernie, but the Saudis hands are dirty enough. Saunders isn’t a fool, so the only reason he’s spouting this obvious foolishness is to have something to say which – at the only glance Joe Sixpack gives it – sounds good. Senator Sanders has long supported a two-state solution that recognizes Israelâ€™s right to exist in peace and security, and the Palestinians right to a homeland in which they control their political and economic future. Notice how the right to peace and security is something only for Israel. Palestine will be subject to periodic thrashings if that theoretical new “nation” ever annoys the Zionist overlords who will remain in control of everything except “politics” and “economics”. Saunders has a few things going for him on the domestic front, but I’m beginning to doubt if he’s worth my theoretical vote. I can’t recall an election where every single candidate was compelled (or volunteered) to swear allegiance to another nation thousands of miles away. To place the welfare of that other nation above our own. It’s “Sanders,” not “Saunders.” Sheesh. Itâ€™s sickening, disheartening to see almost all the major presidential candidates genuflect to this orthodoxy of â€œAssad must go.â€ Itâ€™s as if youâ€™re dealing with a street hustler who you know is feeding you a line of b.s. yet he wonâ€™t let up with his windbaggery nonsense. Whatâ€™s truly scary is the way Hillary Clinton saber rattled recently at the CFR conference. Sheâ€™s likely going to be the leader of the United States, with her finger hovering near the nuke launch button; yet she droned on and on to the CFR ruling class that she wonâ€™t back down from any perceived threat anywhere. Contemplate for a moment what this truly means. Of course this means sheâ€™d seriously consider attacking Russia if the paranoid and imperialist Washington establishment deemed Moscow a worthy target! This is serious business, when the supposed coolest and smartest person in the room (the Harvard educated and former head of State, Hillary Clinton), with all the forthrightness she can muster, implies to fellow elites at the CFR about the worthiness of launching bombs on Russia. Let that sink in. Itâ€™s sickening, disheartening and frightening to see almost all the major presidential candidates genuflect to this orthodoxy of â€œAssad must go.â€ Itâ€™s as if youâ€™re dealing with a street hustler who you know is feeding you a line of b.s. yet he wonâ€™t let up with his windbaggery nonsense. Whatâ€™s truly scary is the way Hillary Clinton saber rattled recently at the CFR conference. Sheâ€™s likely going to be the leader of the United States, with her finger near the nuke launch button; yet she droned on and on to the CFR ruling class that she wonâ€™t back down from any perceived threat anywhere. Contemplate for a moment what this means. Of course this means sheâ€™d seriously consider attacking Russia if the paranoid and imperialist Washington establishment deemed Moscow a worthy target! This is serious business, when the supposed coolest and smartest person in the room (the Harvard educated and former head of the State Dept., Hillary Clinton), with all the forthrightness she can muster, implies to fellow elites at the CFR about the worthiness of launching bombs on Russia. Let that sink in. Whatâ€™s truly scary is the way Hillary Clinton saber rattled recently to the CFR bigwigs. Sheâ€™s likely going to be the leader of the United States, with her finger near the nuke launch button; yet she droned on and on to the CFR ruling class recently that she wonâ€™t back down from any perceived threat anywhere. Contemplate for a moment what this meansâ€¦ Of course this means sheâ€™d seriously consider attacking Russia if the paranoid and imperialist Washington establishment deemed Moscow a worthy target! This is serious business, when the supposed coolest and smartest head in the room (the Harvard educated and former head of the State Dept., Hillary Clinton), with all the forthrightness she can muster, implies to fellow elites at the CFR about the worthiness of launching bombs on Russia. Let that sink in. This shift in foreign policy phraseology coincided with the inauguration of the Baku-Tbilisi-Ceyhan (BTC) Oil Terminal in the Eastern Mediterranean. The term and conceptualization of the â€œNew Middle East,â€ was subsequently heralded by the U.S. Secretary of State and the Israeli Prime Minister at the height of the Anglo-American sponsored Israeli siege of Lebanon. Prime Minister Olmert and Secretary Rice had informed the international media that a project for a â€œNew Middle Eastâ€ was being launched from Lebanon. This announcement was a confirmation of an Anglo-American-Israeli â€œmilitary roadmapâ€ in the Middle East. This project, which has been in the planning stages for several years, consists in creating an arc of instability, chaos, and violence extending from Lebanon, Palestine, and Syria to Iraq, the Persian Gulf, Iran, and the borders of NATO-garrisoned Afghanistan. The â€œNew Middle Eastâ€ project was introduced publicly by Washington and Tel Aviv with the expectation that Lebanon would be the pressure point for realigning the whole Middle East and thereby unleashing the forces of â€œconstructive chaos.â€ This â€œconstructive chaosâ€ â€“which generates conditions of violence and warfare throughout the regionâ€“ would in turn be used so that the United States, Britain, and Israel could redraw the map of the Middle East in accordance with their geo-strategic needs and objectives.